BuildTrack WINS the globally recognized award in the area of ‘Internet of Things’, within the ‘Connected Home’ category by Postscapes, a leading global publication in the ‘Internet of Things’ spaces.BuildTrack is the only Indian company to win this 4th Annual Internet of Things Awards 2014-15 in this category and the torchbearer of the ‘Make in India’ in this key area. The ‘#IoT Awards’ as they are named, seeks to highlight and celebrate the year’s best projects, companies and ideas helping to create an Internet of Things. The Connected Home award recognizes products that should be part of everyone’s family. 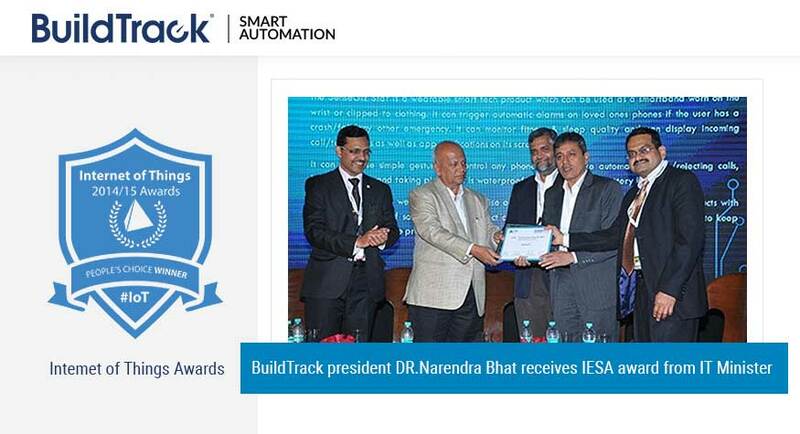 BuildTrack has also WON the “Most Promising Company Award 2014-15” by IESA (India Electronics & Semiconductors Association). Dr. Narendra Bhat, president –BuildTrack was present at the IESA Summit 2015 on 2nd February 2015 at Bangalore. The award was presented to him by Karnataka IT Minister Shri. S.R. Patil. The Technovation Awards by IESA aim to recognize role models for innovation and excellence in the electronics and semiconductor ecosystem. The Awards honors India’s best individual contributors and organizations that drive the industry forward; and provide them with a platform to showcase their achievements and product successes.